Isaiah 60:1-6 The splendour of God’s restored people will attract all nations. Ephesians 3:1-12 The Gentiles are included in God’s people through Jesus. Matthew 2:1-12 Magi from the east worship the infant Jesus & give him gifts. 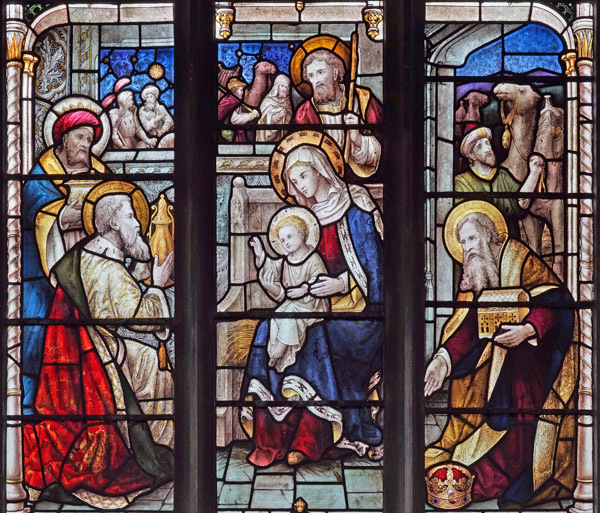 Glass by Lavers & Westlake, 1901, in St. Mary’s church, Linton. Look at the details in this depiction: the crown on the ground, the gifts in the magi’s hands, the entourage ‘outside’ with their camels, Jesus’ hand raised in a gesture of blessing, the star, the hay Mary is sitting on. What else do you notice? How does it help you imagine the encounter for yourselves? • All three of this week’s readings concern the inclusion of other nations – Gentiles – in the promises which God made to the Jews. • Verse 3 of the Isaiah passage, with its mention of “kings” is the origin of the “three kings” idea: Matthew only says “magi” – in effect, astrologers. • Theologians debate about whether the wise men’s visit actually happened, or whether Matthew invented it as a ‘parable’ to demonstrate Jesus’ significance, based at least partly on Isaiah’s prophecy. However, I see no reason why the visit couldn’t have happened, so I take it as fact. • Paul calls the Gospel a “mystery” four times in this passage, but also says that his task, and thus the task of the church, is to make that mystery known to everyone. It suits some people to keep knowledge to themselves as a route to power over others: the church must not do this with the Gospel. Revelation 21:22-26 Isaiah’s vision of God’s light drawing the nations to Israel is re-imagined as being fulfilled in the eternal home of God’s people. Genesis 26:2-5 God repeats to Isaac the promise originally made to Abraham that God’s blessing would be for all nations, not just Abraham’s descendants. John 1:3-5, 14 God’s light and glory and presence are combined in the person of Jesus. Darkness tried and failed to overcome the light, which still shines. Do any other Bible passages come to mind when you read today’s readings? • Give thanks that even when the tinsel of Christmas has been packed away, God is with us, Emmanuel, every day and every hour of the coming year. • Pray for those who feel excluded, rejected, or damaged by the church: ask God to help us make the church a safe, welcoming, healing place for all. • Pray for the nations, that God’s light will dispel the darkness of extremist ideologies of every kind: religious, political, or economic. • Make a New Year’s resolution to give scripture, prayer and worship a higher priority: we can’t expect others to take God seriously unless we do. • As Christians we need to be careful of others when we drive: check that your car has fully working lights, and tyres with good grip for icy roads.